Entry on the Door: £12 both events / £7 day / £7 evening. 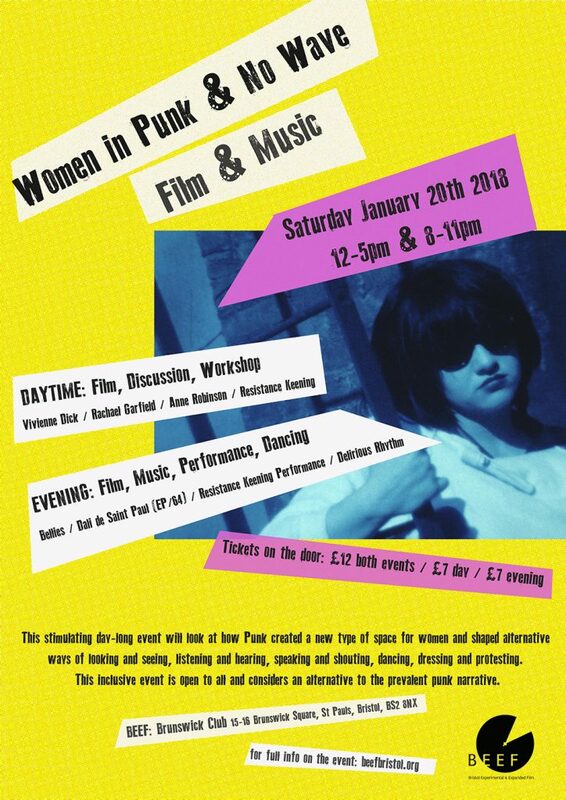 This stimulating day-long event will look at how Punk created a new type of space for women and shaped alternative ways of looking and seeing, listening and hearing, speaking and shouting, dancing, dressing and protesting. This inclusive event is open to all and considers an alternative to the prevalent punk narrative. Rachel Garfield: Selected short film programme inc by Anne Robinson, Ruth Novaczek and Sandra Lahire with introduction to her forthcoming book about women in punk. Rachel Garfield is an artist whose work often deals with disjunctions of narrative to explore the idea of the incoherent subject and the formation of subjectivity. Although primarily her work would be regarded as video-based fine art shown in gallery contexts, the work has an ongoing relationship with the traditions and concerns of avant garde documentary film. In addition to her art practice, Rachel Garfield’s published writing typically explores the positioning of artists, processes of exclusion, hierarchies of victimhood, documentary practices and the politics of the subject, the encounter and the look; indeterminacy in the visual field often through the example of Diasporic communities; Landscape painting and the formation of Englishness in the 20th Century; Research Methodology in practice-led PhD in Fine Art. Anne Robinson is an artist with a multi-disciplinary practice concerned with the perception and politics of time passing, working experimentally with duration, frame, exposure, paint surface, sound and movement. Her 1984 film Real Woman filmed in sunny, Southend is a subversive, seaside adventure with the Poison Girls featuring the amazing Vi Subversa. Bellies! are Bristol based two-piece D-M Withers and Nat Brown. Their first album Sinister World Music is a concept album exploring the sinister dimensions of contemporary life. The Sinister World Bellies! conjure is populated by vast piles of poisonous digital waste, decomposing lives, the tyrannical reign of the credit devil, oodles of drivel, too much data and distracted consciousness. Dali de Saint Paul is a Bristol based improvisation-led musician bringing raw energy and zeal through her vocals to stir up intoxicating emotion and fervour. She performs regularly with Domestic Sound Cupboard, Viridian, HARRGA and will perform for this event with EP/64. An improvisation troupe with variable geometry, EP/64 interact vigorously diving headfirst with their wild, free spirit steering and shifting into a frenzied explosion of sound that has to be seen to be experienced. EP/64 will be joined by Laura Phillips’ filmic wonders.